Everything Instructional Design — We design training courses. I admit, I'm addicted to watching the Food Network parade celebrity chefs in to make amazing dishes, all the while giving step-by-step instructions on how you too can accomplish the same. There is a little bit to their magic that annoys me, and resonates with me as a learning professional. Recently I've begun using this little annoyance as a teaching tool with some of our more inexperienced clients with great success- and you can too! You see, it annoys me that many of these chefs get to their "kitchens" in their little studios and all of the ingredients for their dishes are already measured, poured, or prepped for them into these cute little dishes just waiting for them to crank out their culinary masterpieces. That's not how it happens in the real world kids, and yes- I know it's all in the interest of time yada, yada, yada. The design and development of e-learning course is very much like the preparation and cooking of a culinary masterpiece. Teaching strategies have to be created, storyboards and rough sketches developed, and multimedia assets like animations, audio files, and videos have to be built in order to include them in e-learning lessons. Much like a culinary masterpiece, except in most projects clients come to the table with rough ideas as to what the end product will teach and how. Clients rarely have an accurate estimate of how long it will take to develop multimedia assets for inclusion in their courseware, and the rise of so many powerful rapid e-learning authoring tools promote the idea that courses can be built “in no time flat.” Much of the value in custom courseware development is added to the course during the development of custom graphics, voice narrations, animations, and videos- not in the purchase of a couple of stock photography images. finding new, innovative, and interactive ways for your learners to engage with content is how your course will distinguish itself from a lot of the commercial off-the-shelf (COTS) stuff that’s out there. Next time you find yourself planning a project with a client, rather than using percentages of the project complete, or phases in your instructional design and development process as milestones- use completion of the development of multimedia assets as milestones. This will give your client a much more refined view of how long each of the ingredients in their e-learning masterpiece is going to take to build. If they are budget-constrained, this will also help as they can elect to go with cheaper-to-develop training strategies during the planning process of the project. 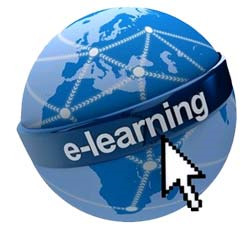 The e-learning industry is booming, what's that mean for instructional designers (IDs)? According to this piece by Forbes, the e-learning industry is poised for a breakout $107 Billion 2015! And that's with a capital B. So, what's all that success spell for instructional designers? Now I ask you, who better to drive said innovation and help subject matter experts develop that truly disruptive idea for how to teach something in a new way leveraging today's technological advances than instructional designers? Of note as well is that the article mentions many sites developing online learning for people to develop their own skills such as Lynda.com and General Assembly; the "consumer online learning space". Not much is mentioned about how many organizations are struggling to figure out how to turn this new world of online learning into a competitive advantage in how they develop their in-house talent. This "corporate online learning space" is a huge area of opportunity for IDs. There is so much innovation in this space that opportunities for instructional designers who continue to develop their skill sets will continue to abound. The online learning industry is far from a zero sum game, the pie is already large and growing. If you're not getting your share, you've really got no one else to blame but yourself. What other opportunities for the online learning industry do you see that could lead to even greater growth rate than what was forecast in the Forbes piece? For this week's blog post, I asked a friend of Collabor8's who is a trainer but lacks an instructional design background what some of her pressing questions about the field are. I come across a lot of traders almost by accident fell into the respective roles, and I hope my answers to the following questions below can be a resource for them. 1. How do you come up with a system for planning, monitoring, and analyzing instruction? How do you come to the conclusion if it will work? What's the average timing in advance does this entail to prep? Answer: The simple answer to this question is you don't reinvent the wheel. A system for planning, monitoring, and analyzing the impact of instruction IS what we refer to as the science of instructional systems. A few years back I made an interesting observation. Trainers, HR professionals, recruiters and business people in general shorten the name of our field to instructional design or ID. Here's my observation- when you look at my master's degree on the wall it doesn't say instructional design. I am actually a master in the science of instructional systems. You see, a system contains inputs which get processed to create a set of outputs. If you look at any of the instructional design models, like ADDIE, there are many inputs into an instructional system: information about the target audience, information about skills gap that is preventing that target audience from performing in a certain way, information about learning environment available to you as a trainer, information about your budget, information about the delivery options you have at your disposal, etc. ; All of this information is fed into an instructional system or model and gets processed during the design and development phase of the system, to hopefully affect and impact the performance by your target audience. This is the output of instructional systems- namely, improved performance. 2. How does one create a chunk for facilitators? Do they all follow same format? Answer: This is a bit of a loaded question, one that researchers in the field of cognitive load theory continue to ponder. Basically, when creating a unit of instruction for your learners it must be small enough to be digestible yet not so large that it increases the complexity and reduces the learning by your students. Although subjective in nature, one of the things instructional designers are taught is to chunk similar content or skills into units of instruction and during a formative evaluation of your course (similar to a focus group in marketing) you ask for feedback on whether the units of instruction were too short, too long, easy to acquire, etc. There is no one absolute and correct way to chunk information into a unit of instruction. One must take all of the variables known, prototype instructional unit, and tested using a group of subjects as similar to the target audience for your training as possible. 3. In the ADDIE model, how do best approach the design portion? Only looking at what was analyzed? What does that entail specifically and does it overlap with other aspects in the process? Is ADDIE the best approach or are there others that are as successful and used regularly? Answer: Have you heard the phrase "part art, part science"? At Collabor8 Learning, we approach the design portion of the process with our creative hats on. The designing of a learning intervention, regardless of whether it will be off-line or online, is where instructional design is like an art form. This is where you look at all your variables from your needs analysis, get your creative juices flowing, and fearlessly toss around potential ways to close skills and knowledge gaps. Don't worry about whether one way to teach a skill is better than another, simply gather as many ideas as you or your team have on how the material or skill could be taught. As the team leader, you should not concern yourself at this point whether one method is more feasible than another- simply get as many ideas down as to how something can be taught. 4. How does a facilitator know which model was used when reading material? Is it obvious? Is it important/relative? Answer: Honestly I don't know, and I can't think of a situation where it would matter. Think of it, when you read a book do you ask what the author's writing process was? 5. When asked to write a workshop, what are the basic elements to reference to besides the objective and audience? Answer: So another loaded question, the single most important question you can fire back at anyone asking you to write a workshop is to list the behaviors the learners will be able to perform successfully after completing said workshop. Remember also that any corporate honcho asking you to build a workshop has bypassed the needs analysis phase of an instructional system and has arrived at the conclusion that there is a skills gap that must be closed AND that the learners lack the knowledge necessary to perform in a certain way-hence training is the solution. Always push back on anyone asking you to write a workshop, and request their analysis of why they feel training will solve this performance problem. 6. Besides PowerPoint, what other tools/platforms are there to present to your audience? Answer: I try and remain "technology agnostic" when it comes to the tools we use, but there are many fabulous alternatives to PowerPoint you can use. For a good list that was published quite recently, click here. 7. How does one transition from a facilitator to an Instructional Designer? And is that the most natural transition or are there others to consider and if so what needs to take place? Answer: That's easy, much of the knowledge regarding the science of instructional systems can be learned online nowadays. There are many good reads on the field that you can pick up on Amazon as well. One I am currently reading is "Leaving ADDIE for SAM", by Michael Allen with Richard Sites. You can find it here as well as some reviews others have done on it as well. I am a huge proponent of "learning by doing". If you are looking to transition your career from a trainer/ facilitator to more of an instructional designer- you should seek out a mentor whom you can shadow as they work through several performance challenges utilizing their instructional systems design skills and expertise. This would probably be the best way to transition, sans going back to college and becoming an instructional designer the academic route (which I don't think you need to do). What do instructional designers have in common with professional translators? You see we all-knowing preach how performance doesn't our current a vacuum, and neither should training- regardless of whether we're talking about instructor-led training or e-learning. In order for your learners to best practice the skills you are trying to teach, it helps to visualize and put those skills in the context in which they will need to perform them back on the job. This not only helps with retention, but with skills transfer. Skill transfer refers to any tactics or strategies that you employee in your training to enable learners better recall of information learned well training- after said training has occurred. As it turns out, translators face similar challenges in capturing the flavor, feeling, and the context behind the words they are translating to a second language- at least the best ones do. How can you apply this principle of capturing the context to your e-learningHere's one way you can apply this. Many designers are concerned with a lot of elements of the user interface for the courses. Not just the navigation or what functionality to include in the course player, but what reusable screen design templates can they build to then speed up their course development. Rather than relying on abstract graphic designs or PowerPoint slide templates, ask your client or subject matter experts if they can supply you pictures of the environment where your target population typically performs. These images can be of workspaces your target audience would recognize. Then simply cover the image with a semi transparent color layer of your choice to match your course player template. If you've got more than one of these images, you can actually create different slide templates based on these workspaces which hopefully your learners will recognize. Now your instruction will literally take place in the context of where it occurs in the physical world- in your online course.